If you are searching for “solar providers near me” in Phoenix, Arizona, this guide should help! 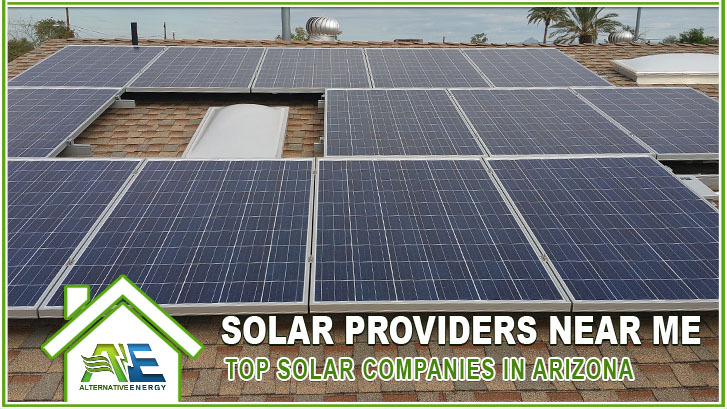 Here we show you how to find solar providers near you and the top ranking solar companies in Arizona. How To Find The Best Solar Providers Near Me? The best way to get an idea if a solar company can be trusted is by reading their reviews online. It’s extremely easy to find reviews about solar providers near you. Simply open up your web browser and search for “solar provider name” + reviews. For example, if you were searching for our reviews you would search: “Alternative Energy, LLC” Reviews. That would bring up a list of all our reviews on Google, Yelp, BBB etc., and give you an idea of what kind of company you are dealing with. An awesome way to discover local solar providers in your area is to ask your closest friends and neighbors. If you notice homes in your area having solar panels, stop by and ask them where they got them from, how much they saved and if they think it is worth it or not. It’s a lot easier to trust your family or friends than your neighbors so choose who you talk too wisely. They use Google Earth satellite imagery to analyze your actual roof shape and analyzes local weather patterns to create your own personalized solar plan. Enter you actual electric bill to tune your savings estimate and automatically get the recommended number of solar panels you need to install for your own home. Compare lease, loan, and buy options for solar panel installation near you. Search local government websites like Phoenix.gov as they will have resources dedicated to solar panel planning and development for residential and commercial applications. Phoenix Government supports local residents and businesses going solar. Who Are The Top Solar Companies In Arizona? We put together a list of the top solar companies in Arizona based off customer reviews from around the web. Alternative Energy is best solar company to buy from because we do more than just solar. We make your home energy efficient first before even thinking about throwing too many solar panels on your room. Most solar companies will sell you enough solar power to cover your current energy usage. We see a problem with that. We Make Your Home More Energy Efficient First! If you live in Phoenix, Arizona or local cities, your home was most likely built with non-energy efficient materials. Meaning, you are spending too much money on electricity because your home is not energy efficient. You are going to save more money if you make your home energy efficient before installing solar panels. Radiant barrier, insulation, duct wrapping as well as other energy efficiency improvements go along way with saving you money on electricity before installing solar panels. We make your home energy efficient first, and then give you an even more affordable quote because you won’t need as many solar panels to cover your energy usage. We can sometimes offer a lower quote with energy efficiency improvements and solar combined than other solar companies can offer for just solar.